Classic American-Pale Straw color, mild in flavor and lighter bodied with a crisp, dry finish. 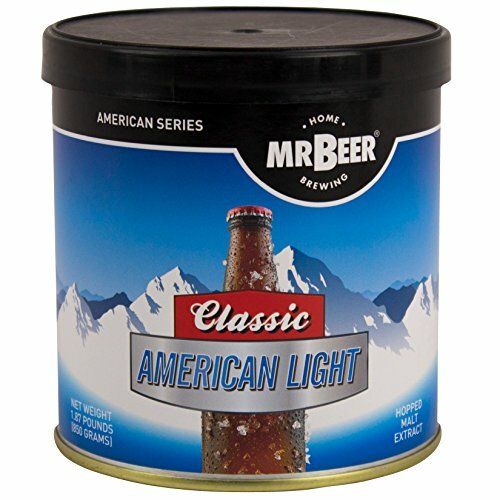 BREW BEER IN 30 MINUTES-Mr. Beer's all grain brewing extract helps cut the brewing process down from 9 hours, with other kits, to 30 minutes with more consistent results. ALL-GRAIN BREWING EXTRACTS-All Mr. Beer's brewing extracts are comprised of only the 3 main beer ingredients, Water, Hops and Barley. If you have any questions about this product by Mr. Beer, contact us by completing and submitting the form below. If you are looking for a specif part number, please include it with your message.